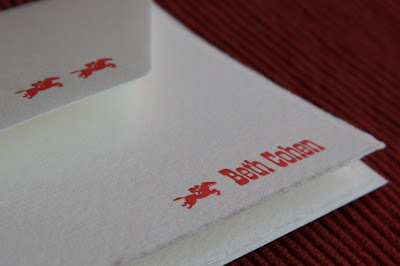 I saw the cute racehorse dingbats in the drawer and the letterpress class and decided to set them for my good friend and long time client Beth. 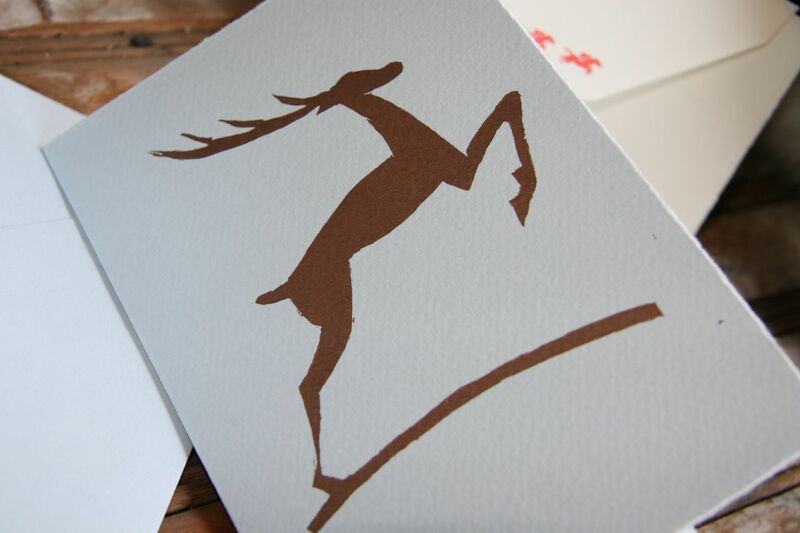 The font is, fittingly, Cowboy 24 point in a salmon color on Fabriano card and envelope stock. I set the envelope with two of the horses in front and one trailing, as if in an actual race. I finished my first set of wedding invitations on the letterpress! This was a custom design collaboration between the bride, my husband, and me. 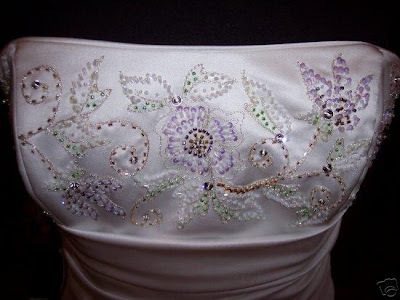 The bride wanted to replicate the floral design on her wedding dress on the invitations. Using the picture below, I drew out a stylized design for my husband to create digitally. And here is a sneak preview of what the final invitation looks like. 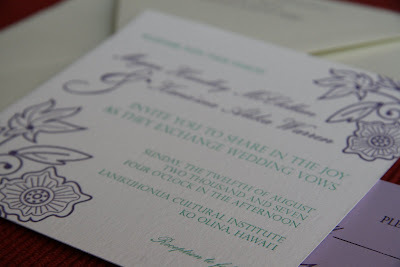 I will put the whole invitation set up for your perusal in a bit. The images I have are pre-assembly. 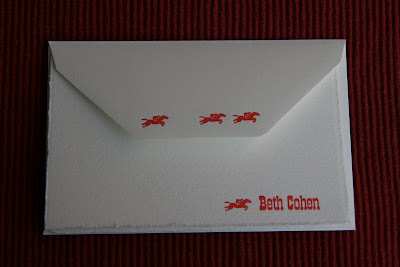 The bride bought the enclosures for the invitations and will be assembling them herself. I learned a lot throughout this whole process. I have pictures that I took while I was making these lovely invites, and I'll be posting those shortly as well. Enjoy! This is meant to be a holiday card. Originally the image had stars on it, which I tried to keep on the linoleum bloc, but clumsiness marred two of the stars, so I think if I put stars on later, I will do it with some dingbats. I had wanted to do a silver or gold originally, but since in class we have to share the machine, we agreed on a metallic copper color (PMS 8560). It came out beautifully on the light blue card, and the color was gorgeous on my friend Carrie's blush colored card as well (she had a linoleum cut of a french bulldog sillhouette). I made a matching envelope for this that I haven't had a chance to photograph yet. 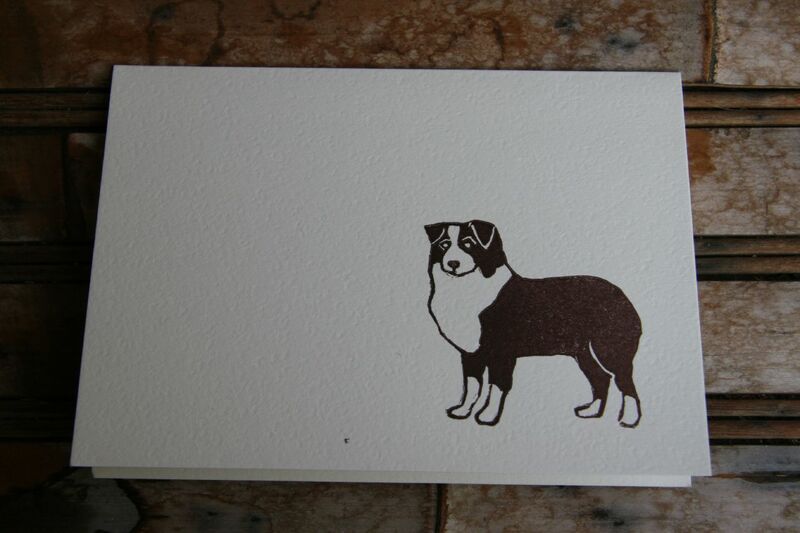 Romeo was jealous of the fact that I made a card with Jezebel on it, I carved an image of an Australian shepherd and printed it. I had wanted to do it in a blue or grey color to match Romeo, but brown was the color of the day on the Vandercook, so brown it was! The fine lines on this came out really well, and I'm very pleased with how it looks. I use a number of different Exacto blades for the fine lines, but I know some people just use the regular carving tools and they come out just dandy. I am going to attempt to print linoleum blocks on my Golding in the near future, in between these wedding projects. I've gotten pieces of advice on how to do this. I'll let you know how it turns out! At a party recently, one of my guests remarked how amazing it was that the cats didn't get into my letterpress setup. Talk about foreshadowing! Monday night while I was printing, Jezebel jumped up onto the letterpress desk and started poking around. Of course, I shooed her away, but not before her tail and paw got a bunch of rubber-based ink on it. DISASTER! Printing was abandoned and chasing the cat down ensued. My cleaning setup is as toxic-low as I can make it. I use canola oil to clean ink off of the press and equipment, and I follow up with just a bit of California Wash to take off the oil residue. Every now and then I use Putz Pomade to condition my rubber rollers and I always use the California Wash on the plates, but other than that, it's mostly just cooking oil. Honestly, I mostly use the California Wash on my hands to get off ink blotches that don't easily come off with soap or oil. At first, we thought the only part of dear Jezebel that got inked was her front paw, so we doused it with canola oil and rubbed it in good. Then we followed it up with some good old fashioned Dawn dishwashing soap (I figured, if it is good enough to clean crude oil off of wild animals, it's good enough to take off diluted rubber based ink and canola oil off of my cat). While we were rubbing the Dawn in, Joel asked where all the ink stains on my pants were coming from. Jezebel then got a thorough rubdown while we looked for the source. Now, she's a black cat and I was using dark purple ink, so it wasn't very apparent where exactly the ink was. We figured out that it was somewhere on her tail and the rubbing in of canola oil and then Dawn continued on poor Jezebel's tail. After we finished with the oil and Dawn, Jezebel got dunked into a bathroom sink filled with warm water. We did this twice, and the purple ink with this treatment came right off once we figured out where exactly it was. Jezebel got her first bath ever. She's well and feisty, and she won't let us anywhere near her scraggly tail to brush it out.